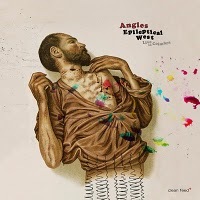 Angles and their recent Epileptical West (Clean Feed 182) live record exemplify what a fully realized ensemble vision can do for the new music scene. Angles at this juncture is a six-man outfit. Altoist Martin Kuchen wrote the pieces in this set. The band as a whole crafted the arrangements. That band includes Mattias Stahl on vibes, Magnus Broo, trumpet, Mats Aleklint, trombone, Kjell Nordeson, drums, and Johan Berthling on the acoustic bass. This is joyously boisterous music. The ensemble plays with a kind of boundless enthusiasm that one all-to-seldom hears today. Listen to “Pygmi” and its adaptation of the pygmy vocal style to the ensemble. It’s a freely articulated full-throttle groove with convincing solos by the horns. It has that classic Art Ensemble/Archie Shepp/Sunny Murray inspired abandon, and it is not untypical of what you get on this fine release. And like the ensembles/artists mentioned above, they can take on something like a kind of funk and transform it entirely into a freely conjoined blastout. Each of the horns gives out with strong solos, the vibraphonist is a centrifugal-centripetal force in keeping the music spinning (while also doing interesting solo work himself) and drummer Nordeson keep the spirit-level elevated with over-the-top bashing. Berthling’s bass solidly pins down the bottom of the sound. It is ultimately the sheer power of the band as ensemble that puts this recording into orbit. Here’s a band I would go see with a feeling of happy expectation. I can’t always say that. The recording translates perfectly well the sort of energy a live outing quite obviously brings out in the band. Wow. What a nice thing this band is! Highly recommended.